If all profiles are activated, 400,000 measured values can be saved – this represents a period of 144 days. Industry 4.0 - on the one hand this means networking and on the other hand intelligent control deep into the system field. The data collected by the sensors on the tip of the robot arm is transmitted to a development team on the other side of the world. This technology requires a power supply with the highest quality and reliability. Data processing in real-time cannot tolerate voltage dips. It is only logical that the energy supply is not monitored with a multitude of instruments but rather integrated in a single, modern monitoring system – just as the philosophy of Industry 4.0 advocates. The UMG 103-CBM is an ideal building block for measurement data acquisition at the front line. Together with master devices (e.g. 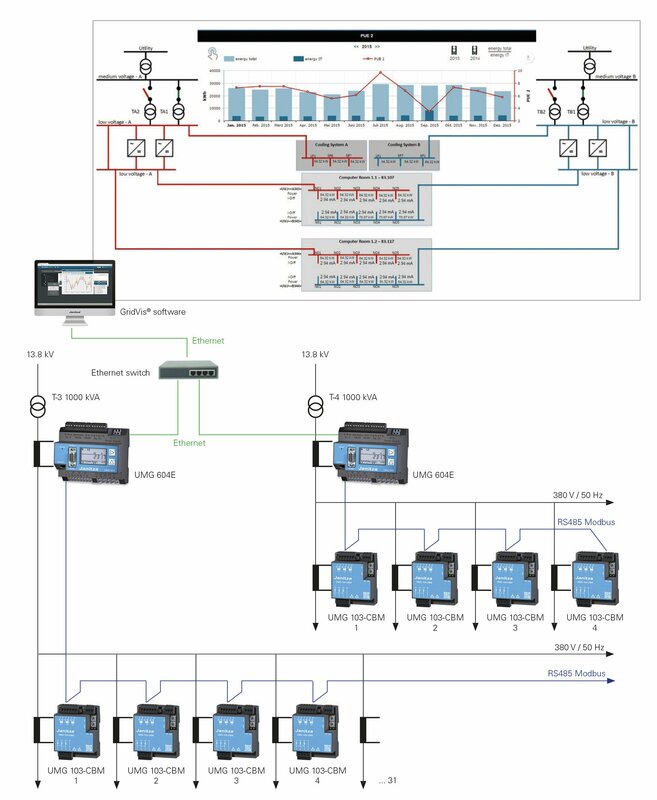 UMG 604E or UMG 96RM-E) and the GridVis® software, this allows scalable solutions to be realised. All data is logged centrally in a database and can be recorded and analysed with GridVis® . This not only saves direct costs during purchasing but also simplifies integration, training and maintenance tasks. Because all information can be called up via common, standardised interfaces, the 3-in-1 Monitoring fits perfectly into the Industry 4.0 concept. Fig. : Typical application illustration with 2 supplies, UMG 604 as Master measurement device in the main supply and UMG 103-CBM for measuring the low voltage outputs.